For Louise and Nicky it all began one Christmas back in 2011. When faced with the now customary pile of rubbish bags full of non-recyclable wrapping paper, destined for landfill, they decided something had to be done. This moment of inspiration set them on course to create a range of eco fabric wrapping products that, through good design and tailoring, would be intuitively easier and quicker than paper, whilst still being a beautiful way to present any gift. Initial market research into developing a more sustainable alternative highlighted the ancient Japanese tradition of wrapping with fabric. Market testing showed that whilst people liked the idea of an environmental alternative to paper, they were less positive about the time commitment and skills that would be required to create a beautifully wrapped gift using a sheet of fabric alone. The design process involved professionals from across the textile industry, including: Kate Fletcher; Consultant in Sustainable Fashion & Textiles, Lucy Renshaw; Textile Product Designer, together with a handful of textile design graduates from De Montfort University. 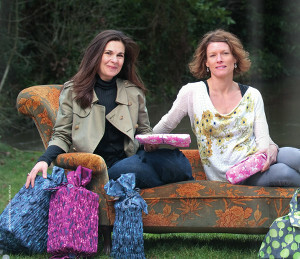 The result is Wrag Wrap, a range of beautifully unique reusable fabric wrapping products. Each product offers a complete wrapping solution, enabling you to embellish your gift with ease. Have a look at our range here.